When I learned this recipe when I lived in Nova-Scotia over ten years ago it was made with miracle whip, white vinegar and sugar for the dressing. Tasted great! Especially after the raisins had soaked up some of this dressing. I've seen it with bacon at a potluck. Today, I do still use mayo, ideally of the vegan variety but later in the summer I'll blog about how to make raw vegan fresh creamy dressings. 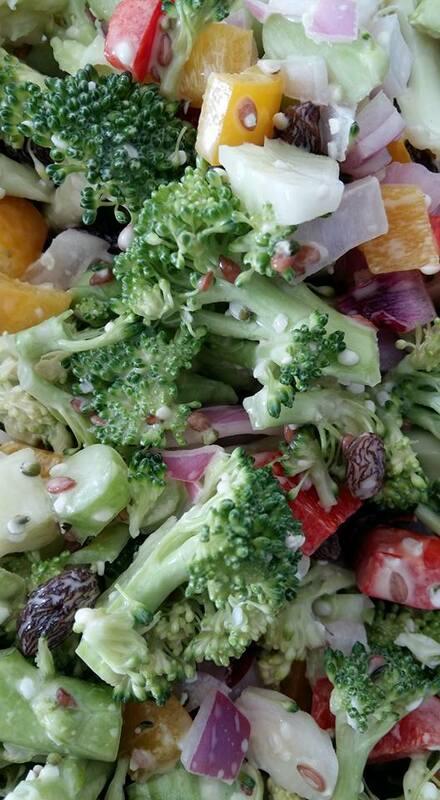 This is my favorite way to consume raw brocoli and it tastes better the day after it's made. Refrigerate unused portions promptly. So start with three big soup-spoonfuls of mayo, whisked (I use a fork) with apple cider vinegar, raw dijon sauce for salad-dressings (optional) a teaspoon of avocado (or sunflower or olive) oil. 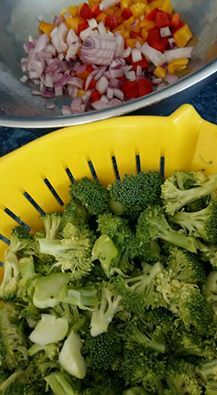 The vegetables at the core of this recipe are brocoli, 1- 2 heads including peeled stems cut small, diced red/purple onion and 1 cup raisins. I often add bell peppers. I also sprinkle the salad with hemp hearts and flax seeds, I love how they swell slightly and add a light nutty flavor. I learned this recipe from the woman who's man taught me to dig for clams and how to eat them right there too. This is a great salad to bring on a pic-nic or whenever you go clam digging.